We offer fertilizer, weed, pest and disease control services for your lawn. Fertilizing is an important part of your lawns health. Too much fertilizer, not enough fertilizer, or fertilizer applied at the wrong time can weaken your lawn and allow weeds to enter. Our objective is to apply the right amount of fertilizer at the right time. Weed and pest control applications are done as needed, only when needed. We use both granular and liquid fertilizers. We can tailor a program to meet the needs of your lawn and/or your budget. Watch the video below to learn more about one of the high quality granular fertilizers we use. Watch the video below to learn more about the high quality liquid fertilizer we use. Stabilized NitrogenTechnology from KAES Marketing on Vimeo. We use only professional products and apply them safely. Children and pet safety is a priority, not a problem. We offer a Modified Organic program that reduces the use of synthetic fertilizer products, but still offers standard weed control. We have a "Front Yard Only" option with reduced cost for those who want nice curb appeal, but may have pets or other reasons to not treat a backyard or an entire yard. Get scheduled early to ensure season long crabgrass control. We offer fertilizer, pest and disease control services for your trees. Trees usually get enough nutrients from the soil for healthy growth, but sometimes they may need a little help due to soil or environmental conditions. Trees can be fertilized by soil injection or a surface broadcast of fertilizer. Biostimulants will promote root growth and increase stress tolerance. Micronutrients, to correct mineral deficiencies, are most effective when directly injected into trees. Pest control applications, such as Emerald Ash Borer (EAB), can be done with a soil drench, bark spray or direct injection. Our ISA "Certified Arborist" on staff can provide the information you need to weigh through the choices of treatment options. Aeration is the practice of removing cores of soil from the upper layer of the lawn. 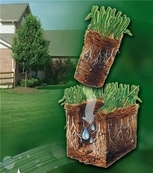 This will help loosen the soil and allow roots to spread, water and air to enter and fertilizers to be more effective. If your soil feels hard (pushing a screwdriver in 3" is very difficult) or water does not soak in, then your lawn may benefit from aerating.